I used to like beer. I used to drink it a lot. But then the whole IPA thing started happening about a decade ago and quite frankly, got completely out of hand. Every craft brewer was trying to out-hop the next guy. I get it, I like spicyness quite a bit. In fact I often take the top off of the pepper shaker to pour the right amount of black pepper onto my salads without having to shake, shake, shake it like Michael J Fox at an onanism competition. But I also don’t eat black pepper with a spoon either. The IPA’s of the past few years have basically tasted like you’re eating a handful of dry hops. No thanks. When you tell people, especially “craft beer snobs” (which seem to populate every corner of the country nowadays) that you don’t really drink much beer anymore, and really prefer wine, they scoff at you for a while, but eventually start poking and prodding around your liquid proclivities. Wine it seems is a mystery to a lot of people. They perceive it as haughty, elitist, or requiring of some special and deep knowledge. In reality the opposite is true. Just like beer, you just have to drink a lot of it to figure out what you like and what you don’t like. I think it is the restaurant wine list that scares people away from wine. It is opaque, filled with code words, and oftentimes triple-digit prices. So they flee to the simple and inexpensive comforts of wheat, hops and barley. I prefer not to relate the circumstances of my tasting of this wine, beyond the fact that it was an important family event. It was delicious. I am not possessed of a Master Sommelier certificate, but there are a few wines I can taste and tell you what they are with absolute accuracy. If I were ever to be given this wine in a blind tasting, I know I would recognize it again. It was both delicious AND unique. I have tasted some likely similarly expensive wines, especially older Burgundies and Bordeauxs, but to my knowledge this Ribera del Duero is the most expensive bottle of wine I have personally tasted. I heard about this wine back in 2009 or so and bought two bottles for about $21.99 each. I cellared, and then quite frankly forgot all about them. Fast forward to late 2012. On New Years Eve I was home alone and had made a really nice roast beef. Looking for something special from the cellar to pair up with the meal, I pulled out the Olabarri and was blown away when I popped the cork. The aroma from the bottle was intoxicatingly complex. Hard for me to nail down the exact aromas, but it was akin to that unique sense from an old European sports car… well worn leather and wood. Truly one of the finest noses on a wine I have ever experienced. I often times don’t finish a wine with dinner, and have collected a few high-tech stoppers to preserve my wines over a few nights… but not that New Years Eve! 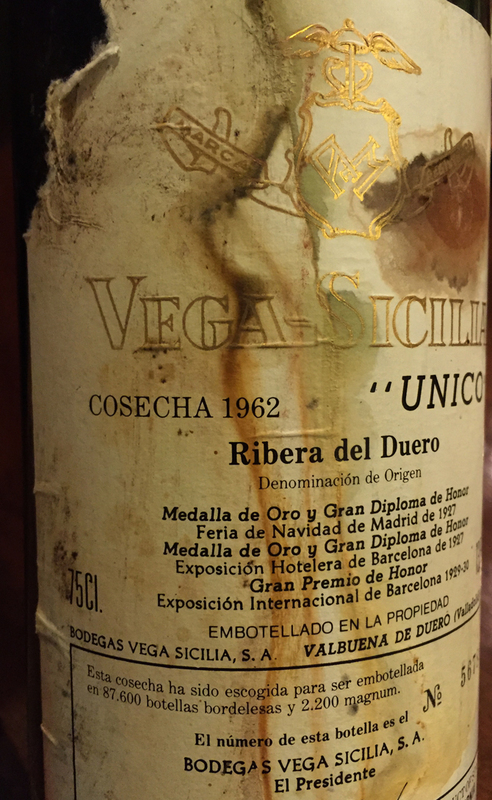 I drank the entire bottle that night, savoring every sniff and sip of that amazing Rioja! I drove home and after a couple of weeks I opened another bottle and thought to myself “What am I doing?…” and called that merchant again to ask how much he had left. “Six bottles” was the answer, and I bought them all on the spot. Since then I have served this wine to several friends, and it receives universal acclaim. I have acquired several bottles of other vintages, but have yet to give them a try, as I still have a stockpile of the 2001s remaining. Under $25, and tasting almost exactly the same as a $1300 wine from the early 1960s. Ponder that for a while.